There’s something special about a grilled cheese sandwich. It’s crunchy, gooey comfort that is difficult to match. However, I made a something of a grilled chese sandwich today that would make the Waffle House imposters hang their heads in shame. I got some asian eggplants and sweet red peppers in my last CSA bag and was looking for a way to use them. Typically I’d harvest some basil from my lame-o plant on the back deck, grab the chili oil and do a spicy basil eggplant dish. 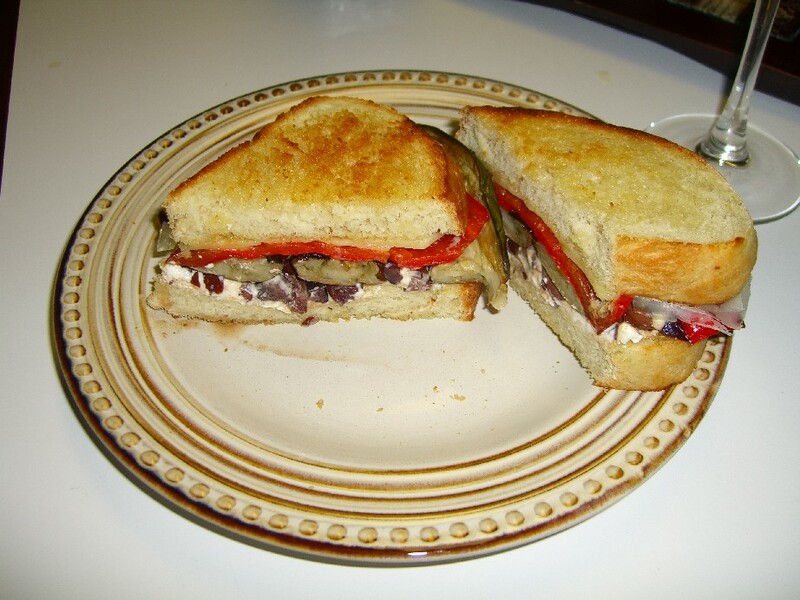 But I stumbled upon the recipe for Eggplant and Pepper Parmesan Sandwiches and since I had some goat cheese on hand, decided to go for it. Not having any baguettes on hand – but did have freshly baked bread – I used my own bread for the recipe. No tapenade, no problem. I diced up kalamata olives, hit them with some olive oil and balsamic vinegar and was pretty proud of myself. I subbed gruyere for the parmesan just because I love gruyere. This one was a 10 out of 10! I probably made some obscene sounds while I was eating it. Unfortunately, not every dish can be a success. 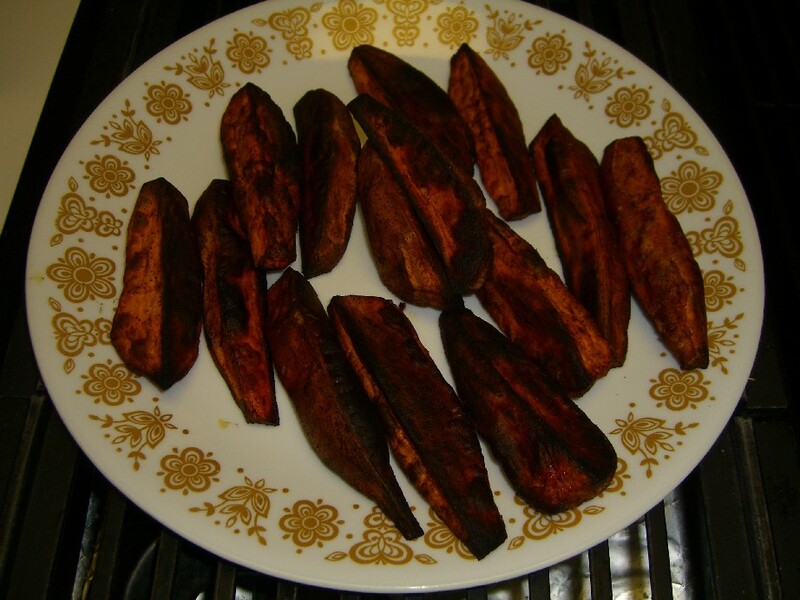 I had planned some Baked Sweet Potato Sticks to accompany my gourmet sandwich. I pretty much followed the recipe, which was probably the problem. Instead of paying attention to my sweet potatoes I was screwing around on the internet. Instead of watching my time and temperature I was picking out a wine for the meal. Kids, you might want to look away. Overbrowned: the PC term for BURNT. Kung faux pas #3: do not blindly follow time and temperature guidelines on a recipe. Don’t let this happen to you! As an interesting side note, this dish set is older than I am. So the sweet potato sticks got a little “overbrowned.” But they actually still tasted ok…if you’re into charred cardboard.